Soup is one of my favorite meals! I love making soup as well-it’s the type of dish that can be very complex or very very simple with equally delicious results. It’s also one of the easiest things to make without a recipe. “Winging it” while making soup is fun, I swear! This recipe is a healing blended vegetable soup-hydrating, easy to digest and quick to make. Delicious butternut squash is full of vitamin E, thiamin, niacin, vitamin B-6, folate, pantothenic acid, and manganese. A cup of cubed butternut squash also provides 582 mg of potassium, (more than the amount available in a banana) and has a wonderful mildly sweet flavor. It cooks quickly and is easy to peel and cut as well. 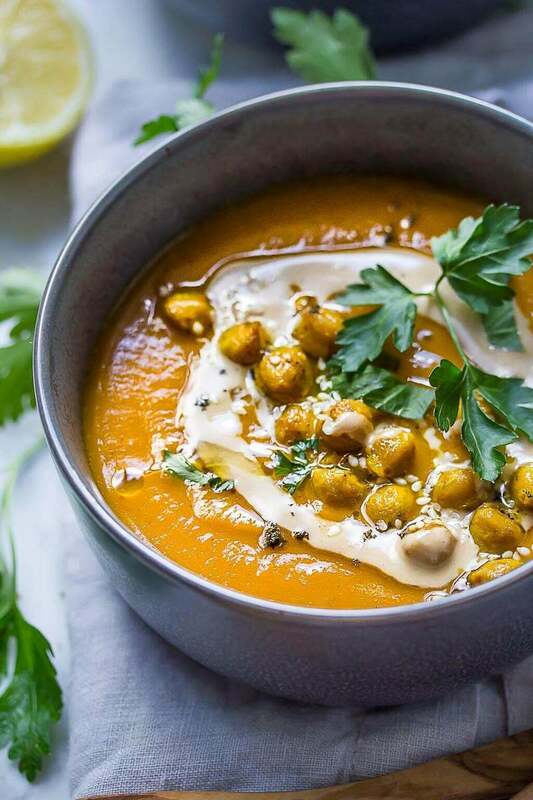 If you love soup, check out these 6 cozy winter soups to have anytime! 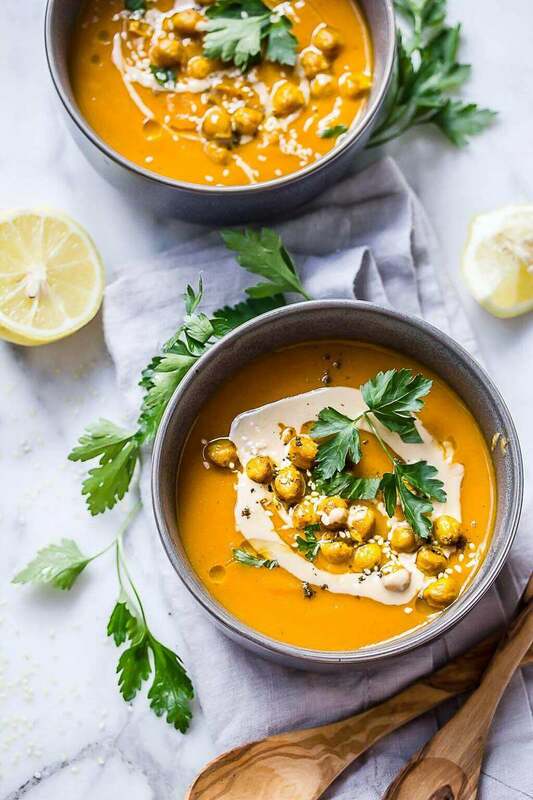 Creamy butternut squash bisque with turmeric roasted chickpeas and tahini is an easy and elegant dinner! For the soup, set your pot on "Sauté" and add the coconut oil, celery, carrot, onion and garlic. Saute for about 5 minutes or until the vegetables begin to soften and brown slightly. Add the butternut squash, water, salt, za'atar, and harissa paste. Bring to a boil and cover and simmer for 20 minutes or until the butternut is soft. When the soup is done cooking transfer to a blender, add lemon juice and purée until smooth. Serve immediately. 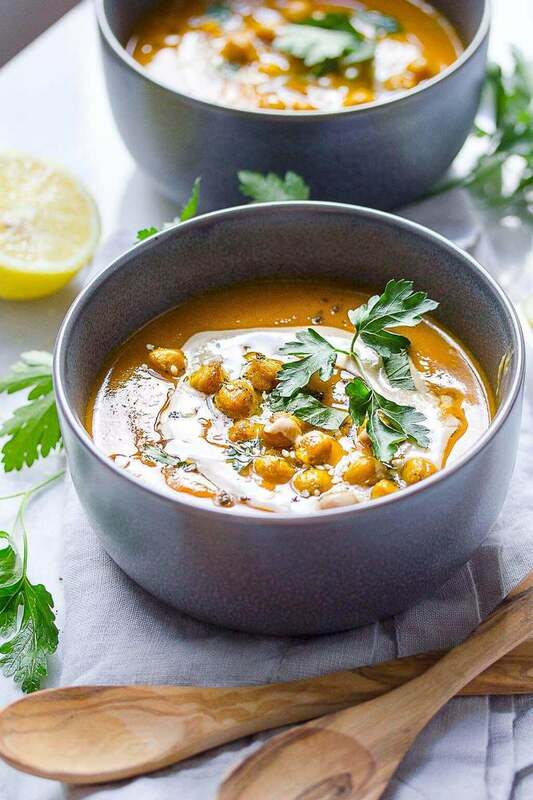 To make the Turmeric and Black Pepper Roasted Chickpeas, drain and rinse the chickpeas and transfer to a small mixing bowl. Toss with the coconut oil, sea salt, turmeric and black pepper. Spread onto a sheet pan and roast at 400 F for 20 minutes.